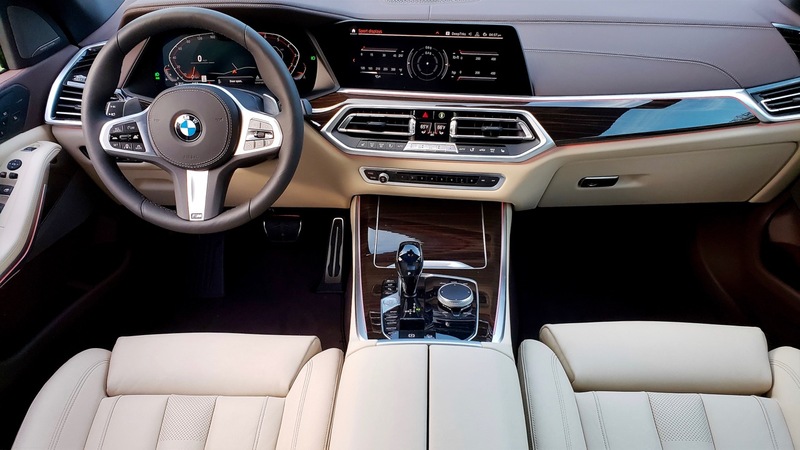 ‘19 BMW X5 XDRIVE50I: DRIVING MACHINE! BMW proves again that a big SUV can move, handle and comfort like a luxury sports car, and sound great doing it – at a price, blogs Dan Scanlan. 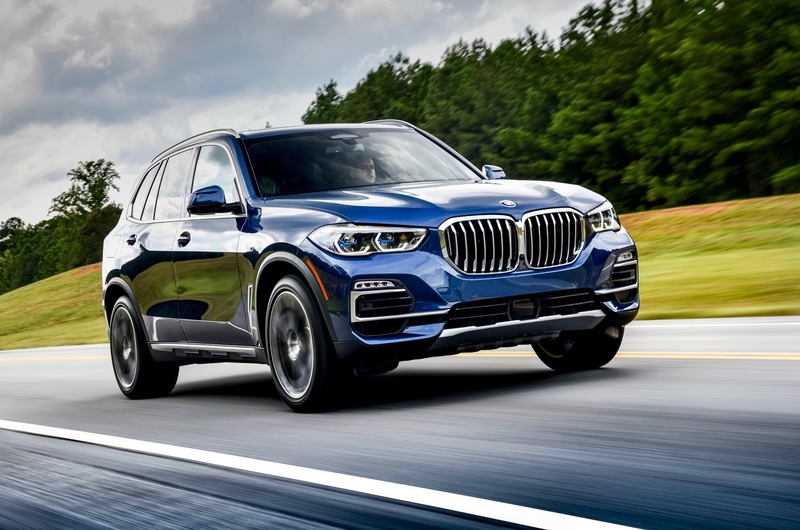 Yes, even a 5,617-pound BMW X5 xDrive40i sports activity vehicle is a driving machine. 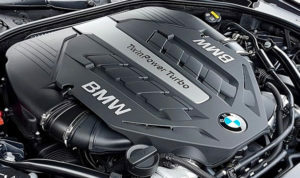 BMW installs a 3-liter twin-turbocharged inline 6-cylinder with 335 horsepower for its base X5, but gave our 50i a twin-turbo 4.4-liter V-8 with 456 horsepower, with 8-speed Steptronic transmission and xDrive all-wheel drive. Yes, you can go econo with ECO PRO to back off throttle to save gas, yet still adjust steering and suspension feel to our favorite Sport setting. Or just click in Sport or Sport+, which modifies the exhaust for serious snarl on acceleration, plus pouring on peak torque of 479 pound-feet as low as 1,500 rpm. Set launch control, deactivating stability control and planting drive mode in Sport+, and our 1,700-mile-old X5 dug in all four Pirellis and launched like a rocket to 60 mph in 4.2 seconds, and 100 mph in 10.8 seconds. There were crisp upshifts and snarling bass exhaust, throttle blips on downshifts, exhaust snorts on up-shifts – and about 14 mpg overall when we remembered to click in ECO PRO. About that Driving Machine mantra – double-wishbone front axle and a five-link rear axle with electronically controlled dampers offered a more comfort-oriented or sportier firm feel depending on drive mode. Comfort softens it just a bit, still taut and quickly reactive to bumps. Sport gave us tight ride movement and very quick bump control with no harshness at compression, with an .8-inch ride height drop. Active roll stabilization limits lean in corners. All-wheel-drive with electronically controlled rear differential lock split drive torque between the front and rear wheels, giving us a heavy but very agile SAV. A control locking function for the rear differential improves traction over less grippy road surfaces, preventing a wheel from spinning when struggling. There’s rear steering to improve turning or lane-changing agility. The result was an agile, flat and neutral X5 at higher speeds than I expected. We noticed a rear-biased setup when playing hard, able to power the rear Pirellis out in a controlled manner in aggressive cornering. The X5 was sure-footed even in the pouring rain we had for much of our test week. We had almost no body roll on our skid pad, with slight and very controllable understeer when pushed in Sport+, which limits stability control. We didn’t have the optional off-road system with height adjustment, skid plates and dirt/mud/rock settings, and the rain kept me from playing in the mud. But in all modes, especially Sport, steering was spot on, with lots of feel and precision. Brake-by-wire had a nice bite high on the pedal and solid, nose dip-free stops with no drama and no fade after repeated use. 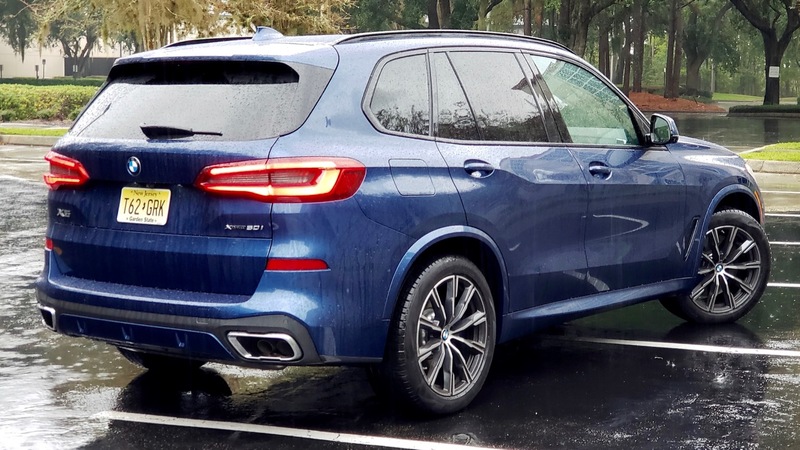 Our X5 also had optional Active Driving Assistant, adding blind spot detection, lane departure warning, cross traffic alert, and rear/frontal/pedestrian collision warning to a near-autonomous SUV. Panorama and 3D camera views on the main screen helped parking, or there’s self-parking and a Back-Up Assistant. The latter will automatically steer you backward as your ride the brake in a narrow driveway, letting the X5 back out, remembering how you drove in up to about 50 meters. It worked fine. 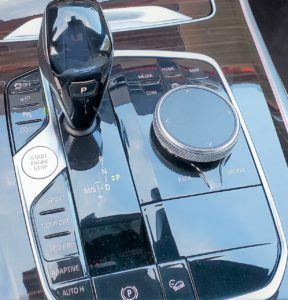 Active cruise control maintains speed and distance, coming to a full stop when traffic does, then resuming when it moves again, without touching the “Resume” button.” Traffic Jam Assist handled stop and go driving hands- and foot-free, up to five mph. Lane Keeping Assistant was very active and annoying, always nudging the steering wheel too much to keep the X5 centered. And the steering wheel would sometimes pull one way or another when I detected nothing, as if the SAV was trying to help me. Since its 1999 debut, there are more than 2.2 million X5s in the world, the fourth-generation we had built in Spartanburg, S.C. And it really looks a lot like the third-gen. The X5’s wheelbase is 1.6 inches longer, the body just an inch longer and taller, plus 2.6-inches wider. The familiar upright twin-kidney grill is more squared off and taller, the boxier nose design making it appear a bit longer. The quad headlights’ high beams are now Laserlights, up 10 times brighter than LED headlights. It’s much more aggressive than 2018. 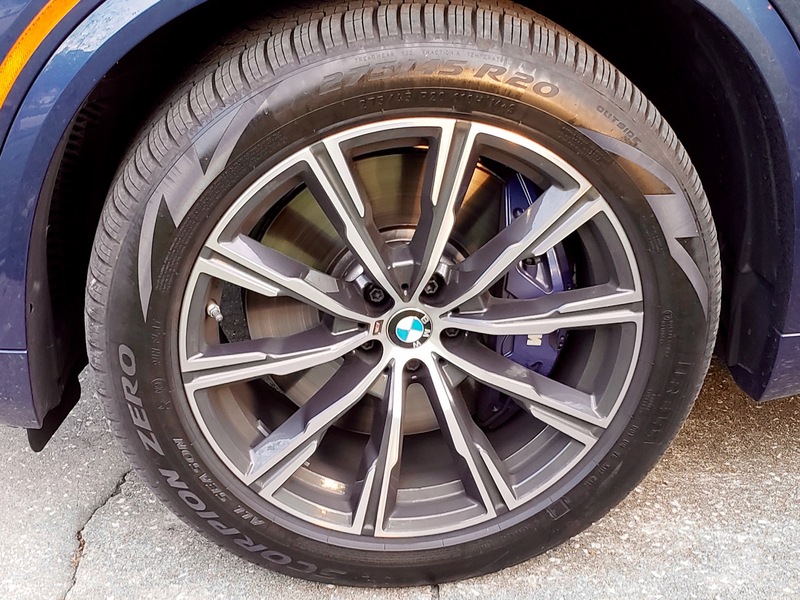 Our model had M Sport additions like 10-spoke satin alloy and pewter wheels showing huge disc brakes with blue M-badged calipers front and rear, all shod with P275/45R20-inch Pirelli Scorpion Zero run-flat rubber. As you approach, flowing puddle lamps project on the ground as door handles, headlights and taillights glow with the interior. Lit accents on open front door handles flash to warn approaching cars at night that you’ve opened them in their path. Inside, smoother and richer, multiple stitching accented leather on the sweeping dashtop as well as doors and center console. 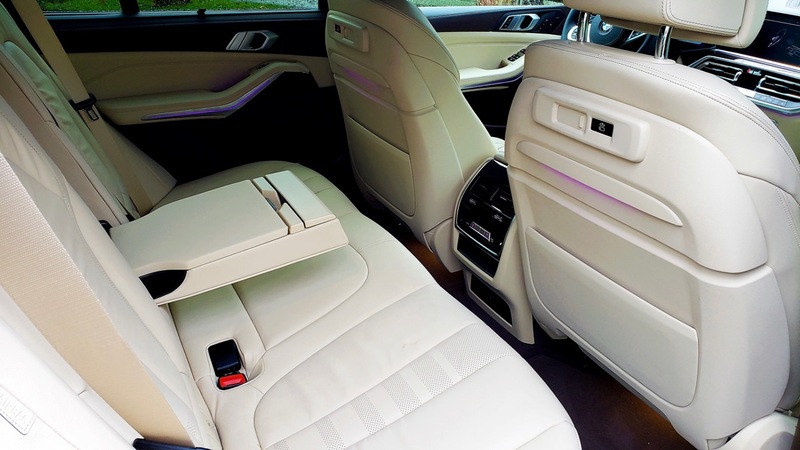 Gloss wood trimmed in alloy with accent lighting is there, and so are M-Sport pedals, driver’s footrest and aluminum trim. Bucket seats offer 14-way power adjustments and dual memory presets, firm and very supportive. 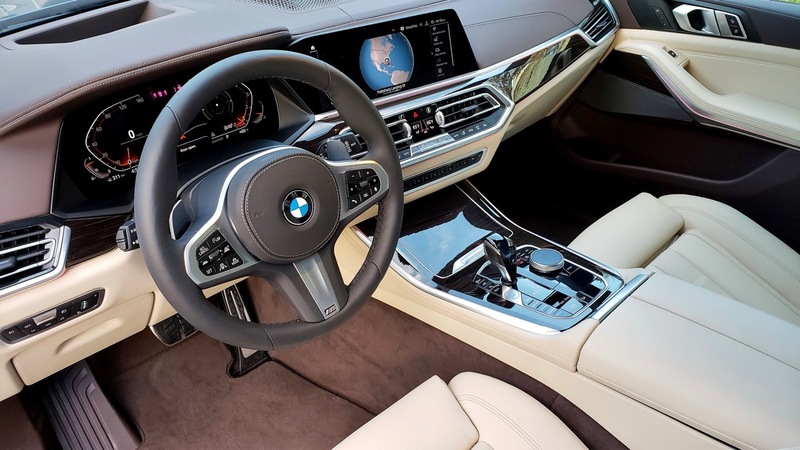 What BMW calls “Live Cockpit Professional” is two 12.3-inch digital displays to replace the previous generation’s analog dials and buttons. The gauge package is wide-screen. Navigation and map are center stage, with configurable safety and fuel mileage information port and starboard. There’s an infrared sensor in the gauge package that reads your hands on the steering wheel, bonging and flashing a warning if you don’t put both in the right places. The head-up display is a seven-inch’s worth of crisp mph and local speed limit, cruise control settings, lane departure warning, navigation, even audio and that steering wheel warning. 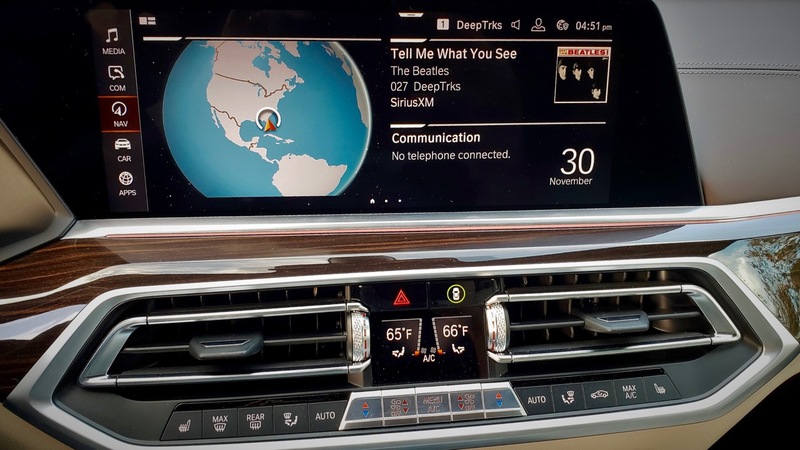 The free-standing center touchscreen handles driving, entertainment, navigation, connectivity, and vehicle info in any combination of four layouts. An app screen has BMW Assist and Message, plus news, weather, parking services and more. There’s a sport display with real-time G-force, turbo boost, power, torque and engine temperature, and an off-road screen with tilt angles and compass. The Harmon-Kardon surround-sound system was solid and clear. The main screen’s audio, map, phone, navigation, settings and more are accessible via the iDrive twist/tap controller with its touch interface. Voice command handles a lot of this as well. The center console’s twin cup holders chill or heat, with an inductive charger slot big enough for my larger smartphone. Back seat room is luxurious, with lots of head and leg room and a panoramic glass roof overhead. The two-section tailgate opens with a wave of a foot under bumper, revealing a large storage area. 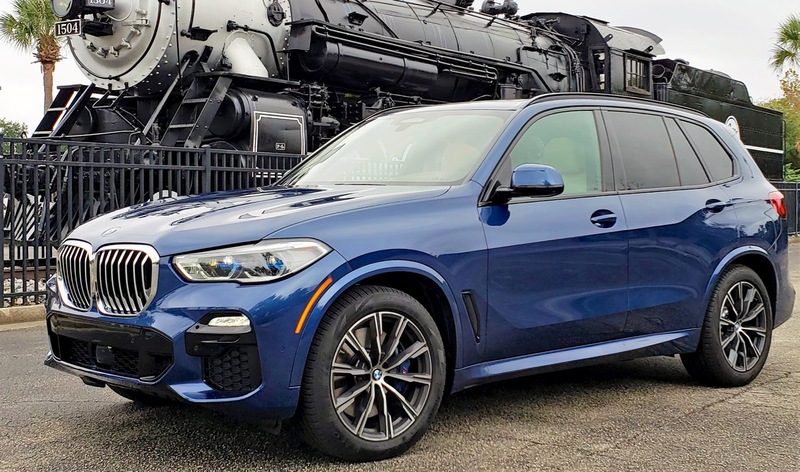 The X5 xDrive40i starts at $60,700, and our 50i xDrive begins at $75,750 plus $995 destination, with standards like launch control, dynamic dampers, navigation, two 12.3-inch digital displays, adaptive full LED headlights and panoramic sunroof. Options included: $3,650 Dynamic Handling; $3,800 M Sport Package; and $2,050 Executive Package with adaptive LED headlights with laser high beams. Final price: A lofty $91,005!